Production value is very important in the region. After impressing the esports world with its presentation in the Overwatch Apex tournaments, OGN’s new foray into PlayerUnknown’s Battlegrounds has a brand new stage and arena that’s just as awesome. OGN’s PUBG Survival Series (PSS) Beta kicked off over the weekend, and with it came the reveal of the company’s brand new stadium for massive PUBG team events. For the debut, the stage fit 20 teams of four players (for a total of 80 players), all on stage at once, in front of a live audience. The reveal went down with lots of flashing lights and lasers and epic music, and it was a sight to behold. It seems like it would be pretty difficult to have 80 players in an arena and make it look good, while also fitting in space for an audience, but OGN pulled it off. The spectating of the event was also quite solid, albeit a bit laggy thanks to the game client. Overall, it’s a pleasant PUBG esports viewing experience. After the first day of matches, EntusA led the field with 610 total points after four games. 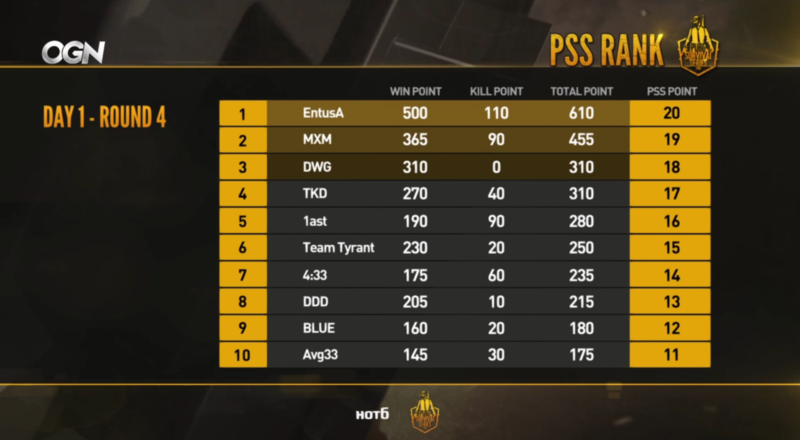 Teams are ranked by placements in each series of matches, meaning that EntusA finished in first and now hold first place overall with 20 PSS points. OGN’s PSS matches are held on Sundays and Tuesdays at 7pm in Korea (4am CT in America). VODs are always available on OGN’s Twitch page.